As a teenager Alan MacSimoin joined the Official Republican Movement but soon moved towards anarchism, later being a founder member of the Workers Solidarity Movement. In this interview filmed in October 2014 he talks about republican debates about militarism and mass politics, the Northern Ireland civil rights movement, the Peoples Democracy march from Belfast to Dublin, the successful anti-nuclear campaign of the late 1970s and the Dunnes Stores anti-apartheid strike of the mid-1980s. The man beside Alan is fellow WSM member Eddie Conlon, later Honorary Secretary of the Teachers Union of Ireland. This A5 magazine was published by a group of anarchists in Belfast, who had earlier that year also published a similar magazine called R@view. 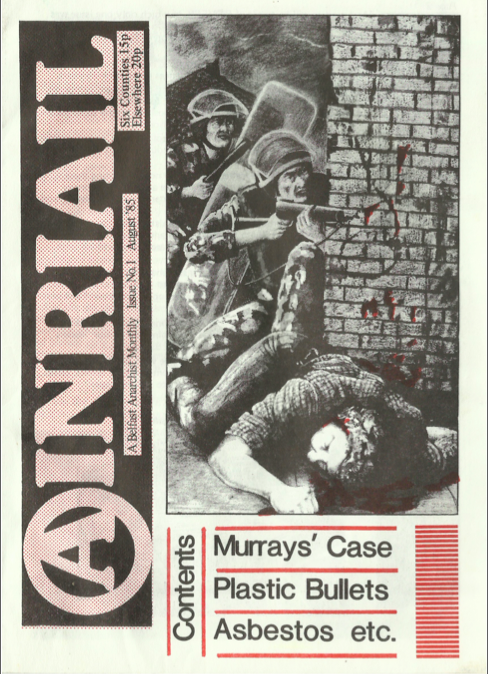 Seven issues of Ainriail* were produced, with the final one appearing in March 1987. As they note in their ‘Who We Are’, “This paper is an attempt to carry on where it [R@view] left off. Our Aims and Principles are a more refined version of R@view’s”. Their politics now placed capitalism at the centre, with various oppressions (national, gender, etc.) flowing from it – rather than seeing capitalism as just one more bad thing. Their goal was explicitly stated as “a classless and free libertarian communist country”. Perhaps reflecting the nationalist ideas surrounding most radical dissent in Northern Ireland during this period, the 26 counties are described as a “neo-colonial” state. For nationalists this meant that sections of the southern ruling class could be won to involvement in the ‘national liberation struggle’ as they were still partially under the thumb of Britain. However, there is no evidence that Ainriail shared this view. Most other Irish anarchists rejected the ‘neo-colonial’ tag and pointed to Ireland’s membership of the EU, the declining role of British investment in the economy, and the rapid growth of a confident native capitalist class since the era of Sean Lemass and the Anglo-Irish Free Trade Agreement in the 1960s. How the use of plastic bullets against marchers supporting the republican hunger strikers in the Lower Ormeau had the effect of making local people afraid to take to the streets, even on issues like the lack of community amenities. The failed court case taken by life prisoners Noel and Marie Murray for conjugal rights in prison. 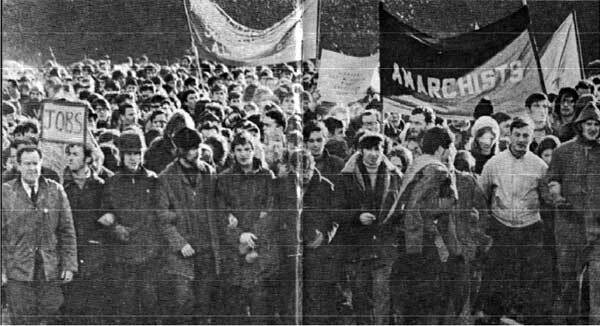 There were two anarchists from a small Dublin group, composed mainly of ex-republicans, jailed in 1975 after the fatal shooting of a garda during a bank robbery. Interestingly, among their legal representatives was Sean McBride, a former Chief of Staff of the IRA and later a winner of the Nobel Peace Prize. 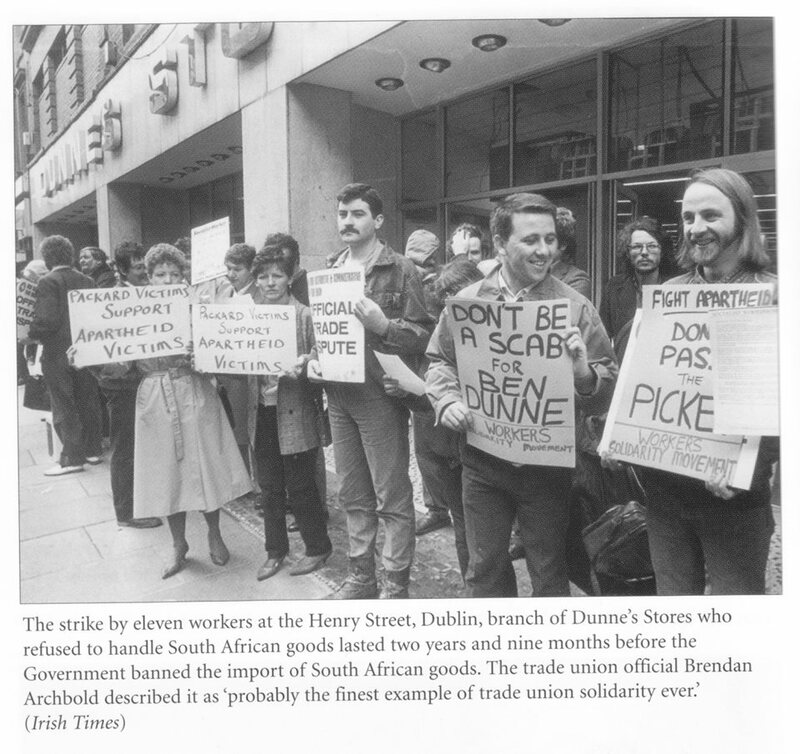 The long running (and ultimately successful) strike against selling South African apartheid produce in Dunnes Stores. The censoring, by the BBC, of the ‘Real Lives’ TV programme because it included an interview with Martin McGuinness – the same man who is now Deputy First Minister at Stormont. The National Union of Journalists held a one-day strike against this censorship, which resulted in the programme being shown later with only minor changes. Asbestos being removed from the Divis Flats in West Belfast by the Housing Executive, and just dumped in open skips on the street. 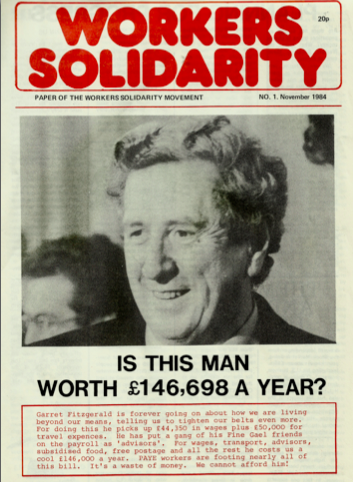 *Not to be confused with the Ainriail published in the 1990s by the Frontline Collective in Galway.